I am the ruler of Fracture. I am looking for blood thirsty players who love to fight. I'm located on Valhalla, and I'm now recruiting. if you join, don't expect to be in the biggest kd in the world, but know that you're gonna have a H3Il of a time! The big banner is cool, but how does it look small? looks big to me... dunno. Rofl your name is awesome. An LDK player gets crucified for a dubious army name and yet this gets applause..
"An LDK player gets crucified for a dubious army name and yet this gets applause.."
The hun helmet was from WWI no-one can take offence from the Germen Empire. lol if people are getting offended from a picture or an armies name they need to take a long hard look at their life and figure out what went wrong. i think maybe you should try figure out whats wrong with your attitute. a man with a whole family including children hanging dead on his gun is grotesque. Shut up. Overcome is right. If you look at the nature of the picture it is simply grotesque, sadly I failed to see it the first time. 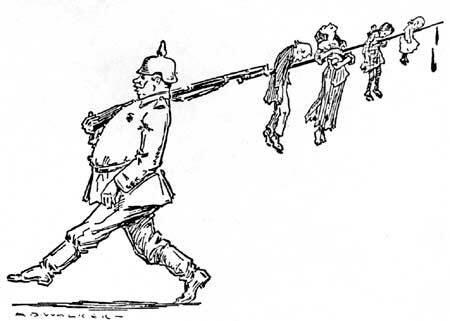 This picture relates of German soldiers killing (most likely) jew families, also the kids. And, seeing the grin on the soldiers face, I think this picture was even made in favour of the germans and thus the genocide of jews. So you still think it is not grotesque? Yes, if you take all that time to sit and think about the inner depths of a picture of course you are going to end becoming angry. Do you know why? Because you take it as something it's not meant to be. This picture isn't glorifying the prospect of killing Jews, it's simply a stupid picture and a stupid picture is all that I will choose to see it as, because I have better things to do than sit on a forum crying about a picture which isn't causing any harm to anyone, minus the people looking for things to get upset about. As most people will tell you, I really couldn't care what you or most other people think about my, "attitute", because hey, you are some random alias over the internet. You don't mean anything to me, you are just a name. So don't criticise me because I choose not to get offended by every little thing which doesn't correspond to my own personal views and prefer to just get on with things. I agree with Squiddy... also that picture looks like WWI not WWII, so it wouldn't be a German soldier killing Jews because the timelines are not right. I agree, there is nothing wrong with this picture, as long as it's just a picture. this shouldn't offend anyone. And also, I think people in WW2 had better weapons in that time than a gun+knife. so this most likely isn't even a jew family, and even if it was. This is just a picture... I do not think it's funny, but neither do I think it's offensive or racist. This is the right to free speech. The drops of blood at the end are the best part of the picture. The kills are fresh. And for those who don't know what nationality or era this soldier is from, I suggest you read a book before posting your unreferenced, half-assed opinions on what era the picture does or does not represent. I disagree Sloth, the soldier is taking a big step over a puddle of mud. I think that's the best part. Ugh, only if you put an 'S' in front of that. Oh... It was a grin after all, I thought it was his mustache. The knife on the end of the gun is called a bayonet in English and is still used in today's modern infantry. I know that picture it's a Pro-war military cartoon. Btw, the guy kind of looks like Von Bismarck, doesn't he? *Septim kicks Overcome into a seemingly pointless pit that should have guard rails. theres lots of it around isn't there? lol wtf is that supposed to be? WOW, how are you able of saying so much bull*beep* just out of 2 sentence? i only answared to you offensive: "lol if people are getting offended from a picture or an armies name they need to take a long hard look at their life and figure out what went wrong. " AND i said nothing about jews or anything! and here is a bunch of people agreeing that im the bad guy, because you told all people here that i was talking about jews and all that other crap you said. lol, its just rediculus how things get out of hand here, cause of confusion and people being imature. you shared your opinion and i should be able to share mine without you accusing me of something like that. i think the picture was horrible cause there are people only 11-12 years old here. and when they see pictures like that, and get a positive experience with it, something goes wrong in there heads. study some pshycologi and you'll see that it aint good for young "unfinished" people to look at pictures like that. however it is true that there are alot of grotesque things around, but if you want to do something good for the sake of man kind, then stop supporting things like this. Lol we just turned this guy with the awesome name's thread into a moral debate. ``Shut up. Overcome is right. If you look at the nature of the picture it is simply grotesque, sadly I failed to see it the first time. Ever seen spiked German helmets in WWII? No! So the killing is justified because these people impaled on the bayonet are french and not jewish? your a sick person. If the cartoon is based on realism, I think it is. You never see bugs bunny bleed. I wouldn't think think a whole family kebab complete with two children can be funny whatever the story is. And the fat guy dont look funny, he looks satisfied. Question: What were you thinking when you posted the image? the guy who posted it is just someone who likes to make jokes. get over it, freedom of speech;) if he wants his KD like that, then he can have it. i like KD's with abit of fun in em. all serieus KD's are to boring in my opinion. Still don't get how that could be a joke. And it is also our freedom to say what is abhorrent to us. So do tell us how this is a joke. THE PICTURE IS FROM WWI, IT HAS NOTHING TO DO WITH JEWS. Iwasfrozen I never bothered being involved with discussions over ethnic differences. Bugs Bunny does bleed... or at least he did on Family Guy. 3/7/2008 5:38:12 PMSo the killing is justified because these people impaled on the bayonet are french and not jewish?